14x21 cm, 24 pages, 250 gsm "White" Strata card cover with colour illustration, black endpapers, hand sewn with navy twist. Click here to see Peter Minter's review in Jacket 27. Click here to see Maria Christoforo's review in Cordite. See below for a biographical note and extracts from Struggle and radiance. 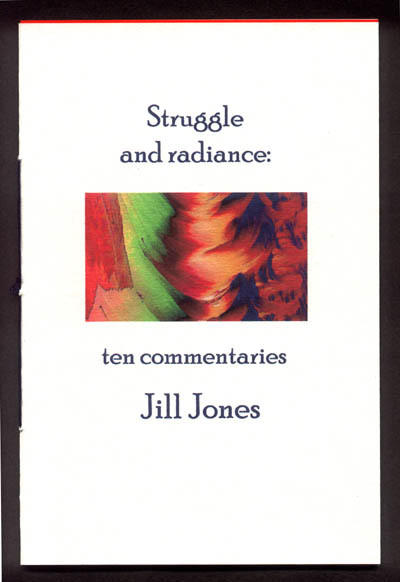 Jill Jones is a poet and writer who lives in Sydney, Australia. Her work has been widely published in most of the leading literary periodicals in Australia as well as in a number of print and online magazines in New Zealand, Canada, the USA, Britain and India. In 1993 she won the Mary Gilmore Award for her first book of poetry, The Mask and the Jagged Star (Hazard Press). Her second book, Flagging Down Time, was published in late 1993 by Five Islands Press. Her third book, The Book of Possibilities (Hale & Iremonger), was published in 1997. It was shortlisted for the National Book Council 'Banjo' Awards, The Age Poetry Book of the Year award, and the Adelaide Festival Awards. Her fourth book, Screens, Jets, Heaven: New and Selected Poems, was published by Salt Publishing 2002. It won the 2003 Kenneth Slessor Poetry Prize (NSW Premier's Literary Awards). She was a co-founder, with Laurin McKinnon, of BlackWattle Press, and she co-edited (with Judith Beveridge and Louise Wakeling) A Parachute of Blue, an anthology of recent Australian poetry (Round Table Publications, 1995).